Libby Pritchett Designs: Digital Scrapbook Day FUN! In celebration of DSD, my team has put together a couple of fun games and contests for us! First, if you missed Lib-ingo last night, there is still another chance to play Sunday afternoon! So, get those cards in! Full details can be found here. Next up, Kristin is hosting a super simple contest. All you have to do is guess how many solo kits I've ever made! Check it out here. And finally, Angie put together this super duper cute ad for me. 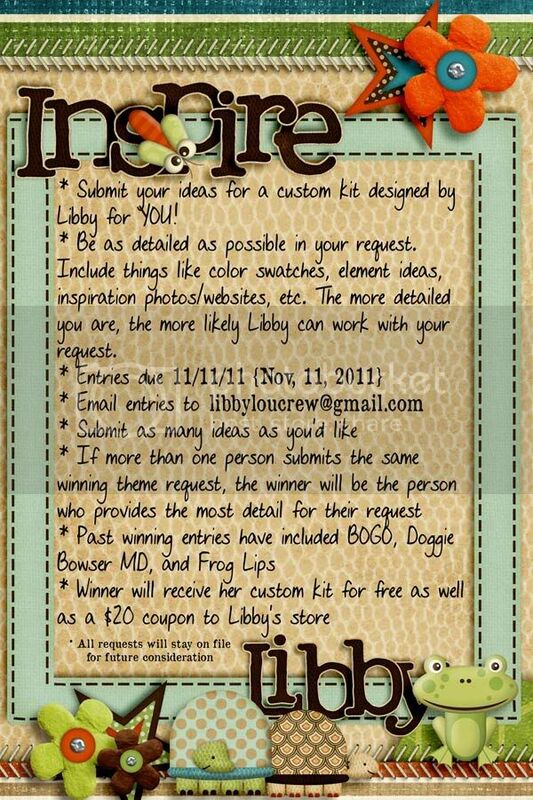 I'm looking for inspiration again, and this is your chance to get a custom kit designed just for you!! And don't forget... everything in my store is 30% off now through Monday! That includes all 7 of my new release products. You don't want to miss them! Hope you're all enjoying your DSD fun!